The Art of Bar Design | Classic Bar, Inc.
At Classic Bars, Inc., we have designed and built hundreds of bars for Atlanta residents. We pride ourselves on providing you with the luxury of enjoying a home bar with all the design features and personal touches you desire. 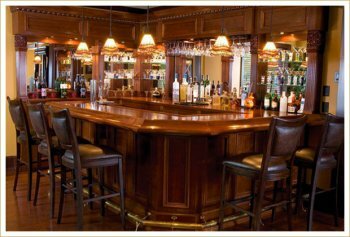 Our professionals use only with high quality wood that meet the demands of a home bar. While we can utilize any type of wood, we recommend popular wood finishes such as cherry, mahogany, and oak for their strength and versatility. The appliances we use in home bars are from respectable and trustworthy name brands. There are many design options to choose from when creating a custom home bar. Speak with our consultant about rails, shelves, maximizing small spaces, and other details to construct your dream bar. For your free estimate, please call (404) 350-9806 and get your classic bar today.